I wasn't taken in this scam. But they are very persistent. They even tried contacting me by sending text messages. I told them to call me. They would respond back that they were hearing impaired and could only respond via text. Sometimes they used the same name. Sometimes they used different numbers with the same name. I thought if I told them they had to sign a contract they would leave us alone. But they continue to send us things but ignored the contract and ignored our puppy questionnaire. I even told them we would not sell them a dog. They would wait a while and contact us again. They always offered us more money to hold a dog for them. Below is just one of the examples. I have deleted the others adn I deleted the text msg. I kept them for a while, but decided to get rid of them. good to hear fro you back..........Once again my name is debaco am from illinios and am well living happy in my home,my son 's birthday is coming up,so need this to present as a gift to him and more so he will be more advantage to us and be more friendship and proper care..........saw your ad on hotfrog when am searching for a new pet that will be part of my family member.........about you you presentation on the ad is so admire to me......thanks.once again. Here are some of the details I will need for final issuance of the Check to you. Once you get back to me with all the above information's, the check or money order will be issued out immediately and it will be sent to you. $100 if you can reserve this for me. So in view of the above, Here are some of the details I will need for final issuance of the Check to you. There is a person claiming to have free puppies. This person is very convincing. They tell you that they are giving the puppies away and all you only have to pay is $100.00 for the ownership documents to be signed over. They will ask you to send the money western union. They also tell you they will send you the puppies through you local airport. They come across honest and trustworthy. DO NOT FALL FOR THIS.This person may be in other places so PLEASE BEWARE. They are also on many puppy websites. BE CAREFUL!! How are you doing and i hope all is good with you,well i went through ur posted dog and i am really interested to buy it and just wanna know if it's still available for sale if so kindly get back to me and if possible attach the picture and the cost ok?i am waiting for you response asap. About the payment,i will pay you with check,and the check will be an over-payemnt,when you get the check and it clears your bank,deduct your money and send the rest to the information i will give you when you get the payment cashed. ing dogs and horses, to have this one incident, but these people are relentless. So be VERY WARY. PayPal payment is what we have been using now since 2004, but none the less, keep your guard up. I am Mark, I got your Ads Posted ... I'm really Interested in Buying Your Cutie Puppy Dog I will Like to Buy it for My Son In Canada Who is Married and Doesn't have Kids,,, I want Him to take them has his Own Kids and children..... Will Like to know your .Last Asking price Best Offer and if you would Accept Bank Money Orders for Payment and if You can make any Arrange for the Shipping .. Let me know .. Please get back to me as soon as possible. We do not ship out of country. Where would the puppy be going to you or your son. We would have to find out where to ship to and you would have to pay for the shipping. I would need to know which puppy that you want we have 6 males and 1 female left. The first one has all the puppies in it. The second has all the blue males, but the 1st and 3rd in that picture are sold. The third has three white males, and all of them are available. The last has two females, but the solid blue one is sold. The bottom price we would take on the puppies is $600 for the ones that have more blue and $500 for the ones that are more white. We have a paypal account set up have you used that before? MY NAME IS LUCKY CASH, I WILL LIKE TO KNOW IF YOU STILL HAVE THIS PUPPY AVAILABLE FOR SALE AND I WILL WANT YOU TO EMAIL ME THE STATUS AND CONDITIONS OF THE PUPPY SO THAT WE CAN PROCEED ON THIS TRANSACTION. This is a message I got from a lady that wanted to buy a pup from me. They said they heard about it in a newspaper that i did not advertise in. I got suspicious and started doing some research. I found your warnings and knew immediately that this person was a scammer. sales documentation and the pick up from your end. issued out immediately. extra $100 for keeping the puppy for me. i have a reputable shipper who handles my goods so i will make arrangment on how it will be pickup from your location and he will ship via airline. if you are ok with this pls get back to me with your Full Name ,Contact Address and Phone Number, so that i can send the payment to you as soon as possible. Thanks and hope to hear from you soon. Am okay with the Price of your Pup. I want to let you know that the money orders will be sent via Fedex and note that the amount on the money orders is $2550. i will email you the tracking as soon as i sent the payment, and i will be responsible for the shippment cus i have a reliable shipper who will come for the pick up and also do the arrangments for the shippment via Airlines. i will let you know when i locate my shipping agent so that you can send him the remaining extra fund for him to get his way down to your place and have the male pup also with the used car i bought shipped. He will be doing neccessary Registartion needed, he will also buy Puppy Crate. if you are ok with this pls get back to me with your Full Name ,Contact Address and Phone Number, so that i can send the payment to you as soon as possible. Please reply me Asap you get this message so i can be sure everything is well. My name is sharon james, l live at WEST ORANGE NEW JERSEY 07052, and it will be glad if you could please get back to me with the types puppies that you have available for sales and also let me know if its male or female and get back to me with the final price for puppy,and the types of payment you will like to take for them right.l will like to know how much you care for the puppy and how playful they are becus l have a Big yard. Thanks very much for your response. I will like to buy the male or female puppies you have for sale so kindly reserve it for me. I am sending you this email to make final reconfirmation of the puppies which am willing to buy for my son as his birthday present and I also want to let you know that payment will be by certified Check . However, I want to alert you on the fact that you will be receiving the Check or money order this week or next week and payment will cover your cost and as well as the shipping cost to be paid to the person that will take care of the pickup in your house.So please as soon as you receive the payment, get it cashed immediately, deduct the money that accrues to you and send the remaining balance to the Head Office of the company that handles the shipment via Western union. More so, I will pay you an extra $145 if you can reserve this for me. So in view of the above, Here are some of the details I will need for final issuance of the Check to you. Once you get back to me with all the above informations, the check will be issued out immediately and it will be sent to you. my name is sharon simao and l will like to know if you still have the Rat for sales and let me know the final price for it and the types of payment you will like to take as a form of payment okay. Thanks very much for your response,i am glad to read from you. I would be buying puppy you have for sale so kindly reserve it for me. You have to bear with me that I called with relay service, its because am hearing impaired. I am sending you this email to make final reconfirmation of the puppy which am willing to buy for my son as his birthday present and I also want to let you know that payment will be by certified Check . However, I want to alert you on the fact that you will be receiving the Check this week or next week and payment will cover your cost and as well as the shipping cost to be paid to the client that will take care of the pickup in your house. So please as soon as you receive the payment, get it cashed immediately, deduct the money that accrues to you and send the remaining balance to the Head Office of the company that handles the shipment via Western union. Moreso, I will pay you an extra $100 if you can reserve this for me. So in view of the above, Here are some of the details I will need for final issuance of the Check to you. l want to make an order for one of the puppy for sale. l will like to know your final asking price and also let me know if you still have it available for sale and its in good condition please. l hope to read from you soon. Subject: Payment and shipping arrangement !!!!!!!!! Thanks for your understanding in anticipation and hope to read from you today. I have received multiple emails from this person-this is his latest email. I especially love when he states that he would like the puppy next week when my ad clearly states they haven't been born yet. time i will be awaiting your respond so i can get them next week. Thanks for your response.it was due to my hear Weiring impaired that lead to the tty and i will like you to reserve one playful male pup for me and also to let you know that payment will be by certified check or money order. In view of this I need you to email me the information that would be required to send the payment, More so the puppy would be taken care of and would be pickup by my shipper as i am located in my address Laura L Carter, # 13508 Jodi Rd,Auburn, IL 62615-9762. 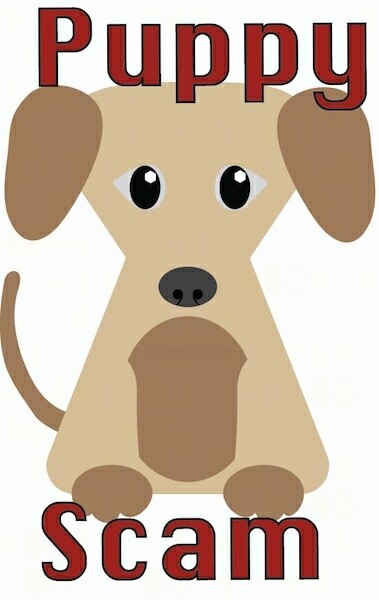 So the shipper would be coming to your location to pickup the puppy with you.Also you need to know the payment will be included with the shippers fee to you and once you get the payment by mail take it to your bank and get it cashed and go ahead to deduct the money acrused to you for the puppy and send the rest balance to the shipper Via Western Union Money Transfer so that the puppy can be pickup from you immediately. for final issuance of the check or money order to you. time,never lacking any care and love from me at any point,i will also send you pictures from time to time for you to see what love i it gets from me. above informations, the certified Check will be issued out immediately and it will be sent to you. Here is a name and email of a scamer that has just contacted me to purchase a dog from me and I wanted to make you aware of this person. Im also copying the email I was sent. Thank you. extra $100 for keeping the puppy for me till the shipper comes for the pick up..
payment you will like to take for them right. are becus l have a Big yard. I hope to hear back from you Asap. I am Lateef Obana, I just came across your puppy thru via your website, Please kindly email me the full details and final price with picture for verifying to my email address......obana50@yahoo.com . I will be looking forward to read from you soon asap and have a nice day. This is Tammy smith and l will like to know if you still have a puppy for sales and it will be nice if you could get back to me with the types of breeds that you have available and also let me know if its female or male and get back to me with the final price for puppy,and the types of payment you will like to take for them right. Note ; l can only make payment by cashiers check okay. please try to understand and let me know,how much you care for the puppy and how playful they are becus l have a Big yard. Honest is the best things in life. There are several puppies still available. What I need from you in order to send you pictures is an idea of what you are looking for. These babies are $700, come with current shots, multiple worming's and a one year health guarantee. There are several litters coming up, the first two will be available the weekend of August 22 and the last one is available Labor Day weekend. They all will range in size from 15-17 pounds and most are black and white though there are a few that may be black brindle as they mature. If you will give me an idea of the gender you want I will start to sending you pictures. I send an e-mail for each puppy so that you can see the pup from all angles. I do require a $200 deposit to hold a puppy and that can be made either through the on line service of Paypal or by mailing me a check. I do also want the balance paid upon pick up and that must be made either in cash or money order as I will not accept out of state checks for final payment. Also I would like to know where you are located because if you are too far away I may not be able to assist you in locating a puppy at all. I am in southeastern Pa. and I do make deliveries on the east coast as long as you are not too far from here. If I can help you or answer any other questions you might have please feel free to contact me again. soon as we seal this deal.Once the money is received by the agent , the shipping agent will contact you immediately to arrange the documentation as well as the pick up immediately. So in view of the above, here are some of the details I will need for final issuance of the check or money order to you. Once you get back to me with all the above, the check will be issued out immediately and it will be sent to you .Hope to hear from you immediately.Looking forward to your swift response i will also be offering you extra $100 for keeping he puppy for me till the shipper comes for the pick up.. I have 3 sable males, 1 sable female & 1 bi Color male left. All the pups are going to be long coats. The bloodlines are import - German/Holland . Pups are just now 6 weeks old. Could you tell me a little about you and your family. I only breed a couple of litters a year. My pups are raised with our family. I do have a contract that states that if you can't keep the pup you will contact me and I will find the pup a home, in addition to if the pup has any genetic problems I will replace the pup with a comparable pup. Below are some pictures of the parents and the pups let me know what you are interested in and I will send you more pictures. Thanks for the response I love the one adolph.JPG and we believe your puppy can make a good companion my full name is Aaron Garcia married to Isabel with one lovely Daugther name Alisia 15 yrs of age . Am a business man and residence in Hibbing Minnesota i do owned my own house, my Family and I and promise your puppy a good happy home which you can also pay us a visit anytime you wish. We'll be glad if the puppy can get to us before my Daugther's birthday will come up in 2 weeks time , i will include the Vet Doctor charges which will include the transport , crate and medical expenses on the payment which you will remite to him as soon as you receive the payment. Kindly send me the name to be written on the check and your address so that my Financial agent can issue out the payment soonest. Just so you know Adolph weighs close to 100 lbs, the Mom Bailey weighs about 65-70 lbs. Below is a picture of the female pup taken 1 week ago. Also I have included pictures of one of the pups from our last litter taken when she was about 8 months old. My pups are $1000.00 and that does include the right to breed if you chose not to have breeding rights the price is $800.00. The picture below titled Rosedau is the pup from our last litter, there should be several pics attached of her at different ages. The pups have had their first round of puppy shots. Is the Vet you know from locally in Portland? Thanks i will go for the female for $800 because am not breeding just need her as a Family so my Financial agent will need a residence address and the name to make out the check to . As i said in my last email i will include all vet doc expenses on the payment which you will then remite to him before he can come for the pick up . You can contact the vet doctor at dr_luis@doctor.com . I will be expecting your reply soon. Aaron, I sent you this e mail yesterday. I will not under any circumstances be remitting payment for anything to your vet. I have my own vet and if you want your vet to examine the pup and pick the pup up that is something you would need to pay for. I have shipped dogs before, so unless you want to have a vet you know involved that is your decision. My vet will provide the health certificate which is what the airline needs, I will buy the crate and there should not be any other medical expenses other than the charges from my vet for the certificate. So unless you have a vet that would like to look at the pup and examine her you can provide payment to that vet. The additional cost to you beyond the cost of the pup will be the crate, health certificate for the airlines and whatever airfare is going for at that time. If you are interested in a pup I will call the airlines here and get a rate, let me know if you want the pup flown to Duluth or St Paul. I also only accept cashiers checks in payment for my pups and will not ship the pup until the check clears. There has been an ongoing scam circulating the internet for years which targets many sellers, and the dog world is by far no exception. Breeders have been again bombarded with offers to "buy the product". The "purchasers" claim they have large amounts of money from an inheritance in cashiers checks or Money Orders that they say their shipper will send to you and then you are to refund any overpayment to them from your personal account. Your check or money order is good but theirs is not. Therefore after a period of time your money is gone and the bank is also returning the counterfeit MO or Cashiers Check to you to be repaid to the bank. Most of these scammers are from Nigeria, Africa, some foreign country and their "helpers" are supposedly going to pick up the product (in our case a dog). Nobody in their right mind will send you a huge amount of money and trust you to send back what you don't need to keep. Many of these scammers pose as deaf, hard of hearing, or speech disabled and take people for large amounts of money. A couple "purchasers" even used relay phone calls. The operators were unaware of what they were asking until it was explained to them and by law, even if they did know they are not allowed to tell you. These scammers will usually have many spelling and grammar errors in their emails. Within the USA - If you have been a victim to a similar scam contact your local Secret Service Agent. It is very important to save the documents with full headers. They are useless with out the ISP header. If you have been scammed be sure to find a site on the net that will let you report it. There are many out there and you can find them by doing a Google search.